Bivalves is a class of marine and freshwater molluscs with about 30,000 species including scallops, clams, oysters, razor shells, shipworms and mussels. Most bivalves are marine usually found in shallower water but some live in brackish and freshwater. Some attach to surfaces others bury themselves in sediment. Their shapes can vary considerably from globe-shaped to flattened to elongated. Most bivalves are filter feeders, using their gills to capture plankton and tiny particles of food from the water. Some are scavengers, some parasites and a few are predators, sucking in small crustaceans and worms. In burrowing species, there may be long siphons stretching from the body to the surface, one for drawing in and the other for pushing out water. Predators of bivalves include sea stars, eels, gastropds (e.g. whelks), octopuses, oystercatchers (birds) and humans. 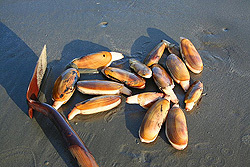 Bivalves use their muscular foot to attach itself to a surface or to burrow. Scallops using jet propulsion. The rapid closing of the valves squirts water out of the mantle cavity, and the animal moves in the opposite direction. Unlike other molluscs, bivalves do not have a brain and have poorly developed senses with only Scallops having complex eyes. The mantle forms a thin sheet (membrane) which surrounds the body and secretes the valves, ligament (opens the shell) and teeth. The major component of the shell, like other Molluscs, is calcium carbonate. 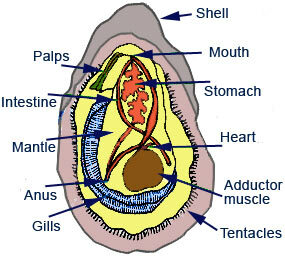 Bivalves are usually male or female but some are hermaphrodites. Fertilisation is external and there are a number of larval stages before they bvecome adults. Many bivalves (e.g clams and oysters) are important food sources all over the world. 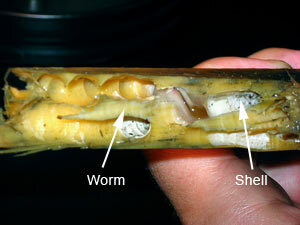 Shipworms are not worms but belong to a group of saltwater clams with very small shells. They bore into and destroy wooden structures found in sea water, such as piers, docks and wooden ships. They have special organ which allows them to breakdown cellulose. The excavated burrow is usually lined with a calcium carbonate tube. They have a slender worm-like shape. The valves of the shell of shipworms are small separate parts located near the worm's head, which they use to bore into wood. Shipworms, for many centuries, have caused extensive damage to wooden structures. In the 18th century they destroyed the timber that supported the sea dykes in the Netherlands. 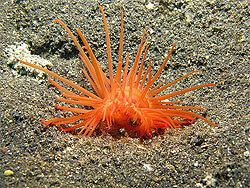 File shells are bivalve molluscs about 4 cm long, with a spectacular fringe of orange tentacles - divers call them flame shells. File shells live completely hidden on the seabed inside nests, which they build from shells, stones and other materials around them. Hundreds of these nests can combine to form a dense bed, raising and stabilising the seabed and making it more attractive for lots of other creatures. File shell reefs are good hunting grounds for young fish, and offer good attachment for scallop spat, as they settle from the plankton. 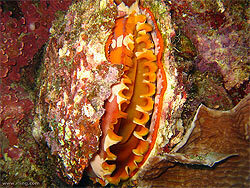 File shells are one of the few groups of bivalves that swim.